One of the best investments I have made. I got the 1/5 hp for my 180g. Quickly cools the tank by .5 degrees with 20 min. Very quiet but not silent. My top off usage is way down. If you struggled with high temps this is worth the investment. Especially if you have plenty of money and time invested in your fish and coral. I have yet to hook this product up, so the actual review may not be honest. 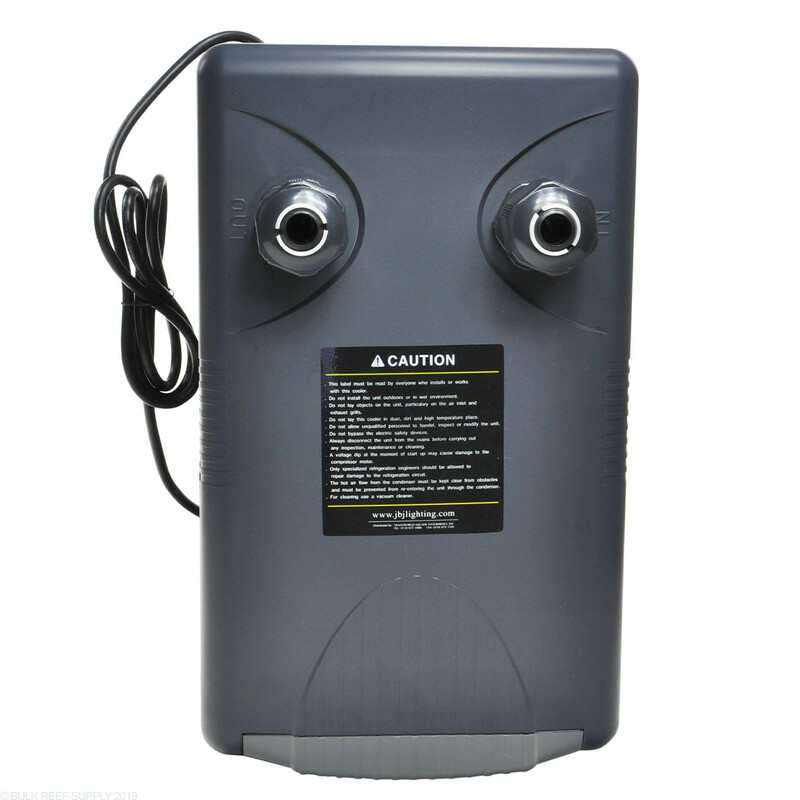 I will say that I'm extremely disappointed in paying $700 plus dollars for this unit and there is no tubing/hoses/ return flares etc. with this expensive item. I can understand the pump, but at least provide the hoses and return flanges. NOTE TO BUYERS: Additional plumbing is required for this item. Once in use, I will return with a review of the item. Excellent chiller. Quiet, which is saying a lot for a chlller - they aren't by nature ever quiet, but this one is. Brings the temperature in my 120g down 1 degree in a good 20 minutes on a hot, humid day. Can't really beat that. Great chiller quiet and perfect couldn't ask for a better chiller and they price matched cause I had found it on sale I love BSR!!!!! Been working since May and loving it! Can't even tell thats it's running in the family room. 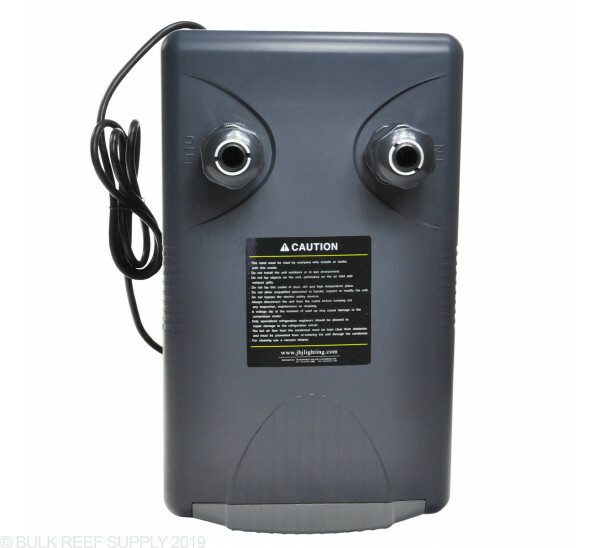 I use this for a 70 gal tank - no problem. Handles the load beautifully, running for less than 5 min per chill cycle. I purchased this here because of the great price, it was $100 dollars more on other sites that i looked on. it does what it says works great, very quiet. Other sites told me i needed a 1/10 unit but i used the calculater on this site and it told me i needed the 1/5 unit. Thanks Bulk Reef Supply for getting me the right size unit at a great price. Would it be possible to hard plumb this to my tank with PVC ? and if so what size fittings would screw on the 1/5hp model ? 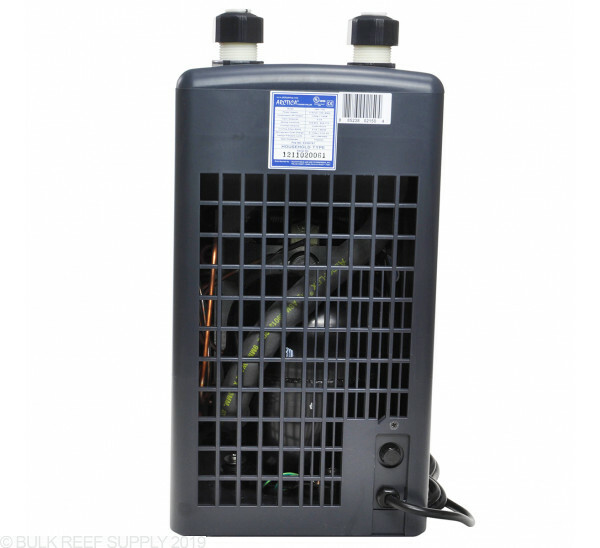 The chiller uses proprietary unions on the chiller itself that attach to barbed elbow connections (they come with a variety of sizes). This is actually idea for a piece of equipment like this as you would want to run pipe to within a few inches of the chiller and then use a short piece of flexible tubing (ideally silicone) to bridge the last few inches. 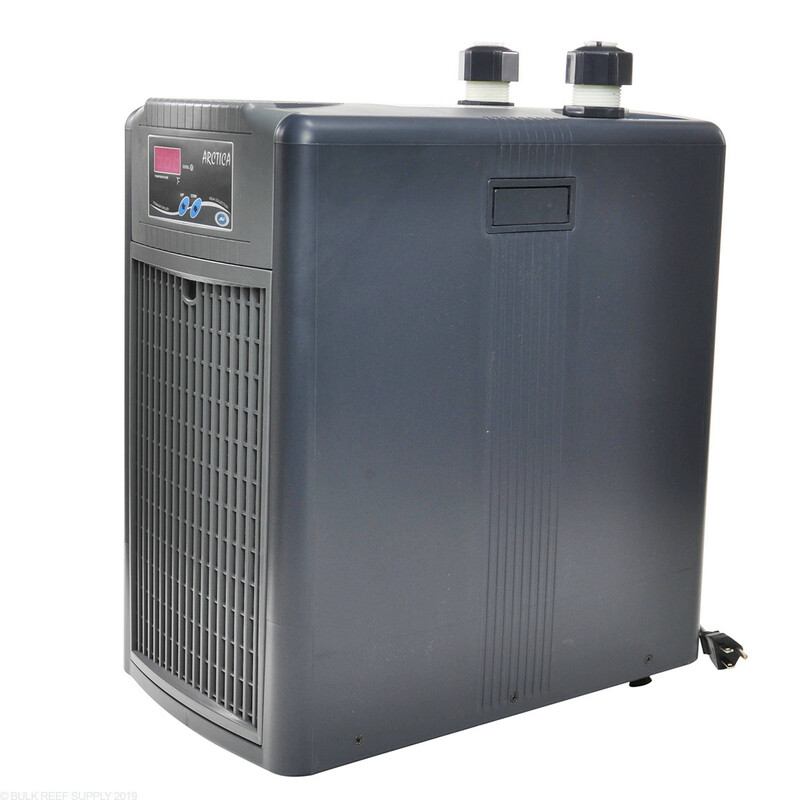 Chillers vibrate quiet a bit and this will reduce the transmission of those vibrations to the rest of the plumbing, which should keep things a lot quieter. 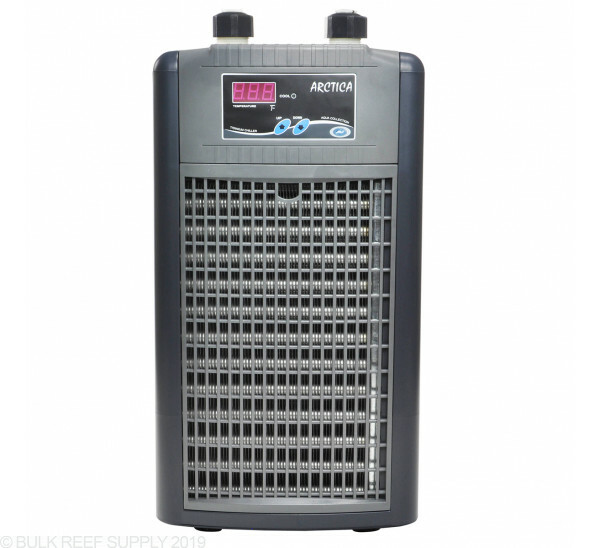 What pump do you recommend for this chiller. 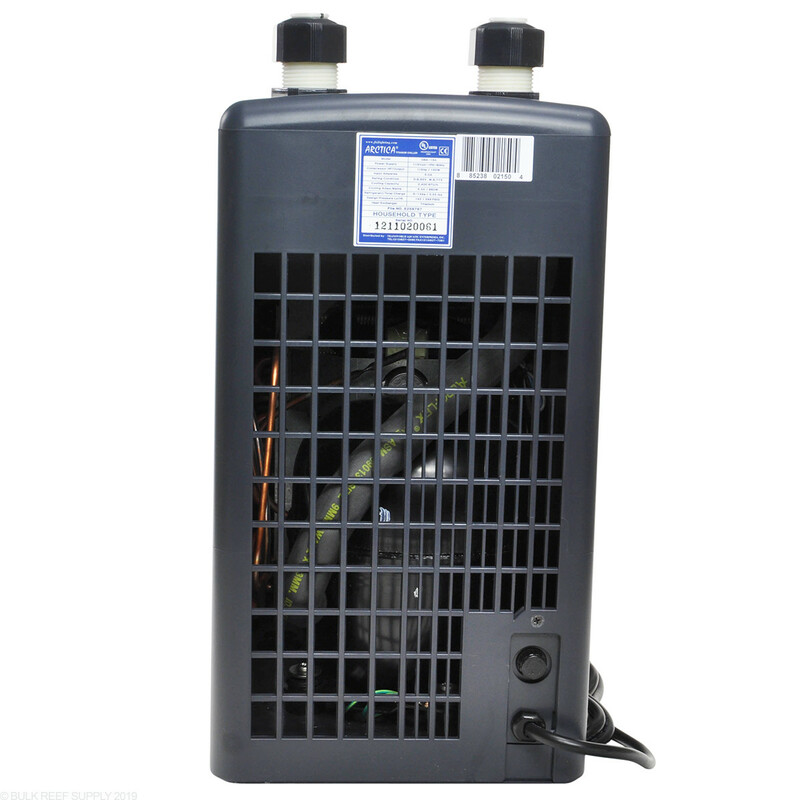 Thanks for getting in touch with us in regards to selecting a pump to use with this chiller. 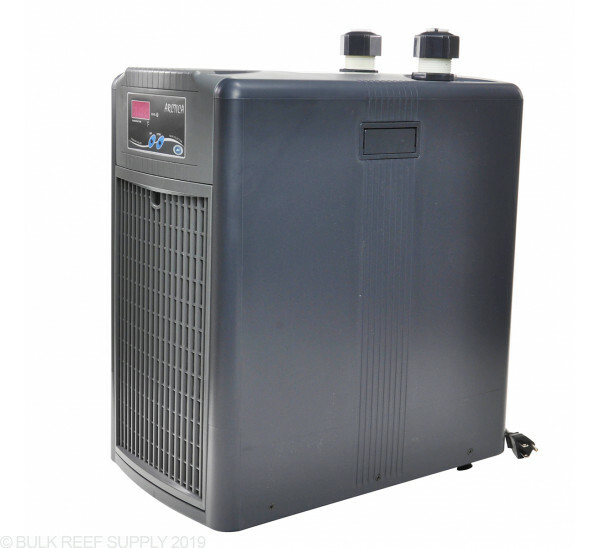 This chiller calls for a flow of 500GPH to 1300GHP flow and will allow for a variety of pump options in this range. The biggest factor to consider when selecting this pump would be calculating in pressure loss for head height, and run length. Please let me know if there is anything else that we can assist with. Thanks! Do chillers heat the tank too? Lets say room temp is 70 and water is 70 will it heat the water up to 80? They do not. 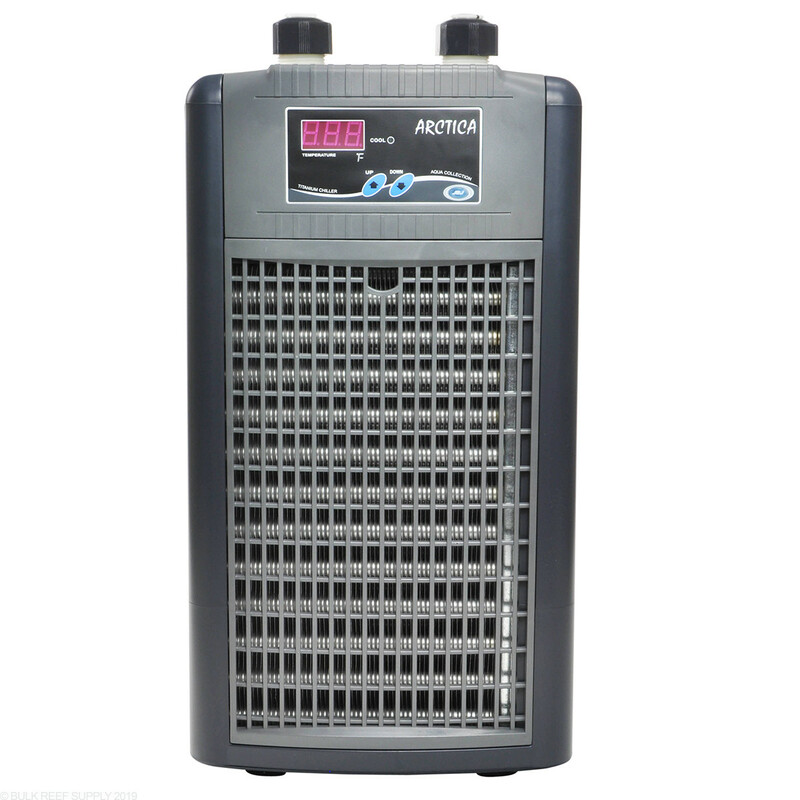 They chill the water to a cool temperature but you would need a separate heater to heat the water if it is too cool.